Also commonly called mountain red cedar or Rocky Mountain Cedar. Rocky Mountain juniper is a long-lived species that often survives to be 250-300 years old or more. A 36-foot (11 m) tall, 6.5-foot (2 m) diameter specimen near Logan, Utah was estimated at 3,000 years old. The species grows as a shrub or tree to 30 feet (10 m) or more and has thin, fibrous bark that usually shreds with age. In the open, trees are stubby and broadly pyramidal with branches to ground level. In shaded areas, the trunk is less tapered and foliage arranges in "weeping sprays". Leaves are scalelike and 0.03-0.11 inch (1-3 mm) long or needlelike and 0.11-0.47 inch (3-12 mm) long. Rocky Mountain juniper prefers calcareous and somewhat alkaline soils and grows best on moist, deep soils. It survives extremes of temperature well. Rocky Mountain juniper is considered hardy except for "burning" of foliage on trees exposed to northwest winds during winter in the northern Great Plains. It can tolerate shade when young, but becomes intolerant later in life. 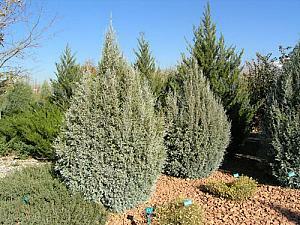 It is more drought tolerant than eastern red cedar and less so than other tree junipers in the west. In fact, during the 1930s drought, Rocky Mountain juniper woodland maintained and expanded range in the western Dakotas. Rocky Mountain juniper occurs throughout the drier mountains and foothills of British Columbia and Alberta; south through the Great Basin and Rocky Mountains to Arizona, New Mexico, and western Texas; and north across eastern Colorado, western Nebraska and North Dakota, Montana, and into Saskatchewan. It is also found on Vancouver and other Puget Sound islands, as well as the surrounding mainland. Rocky Mountain juniper is found over most of the range of pinyon (Pinus spp. )-juniper (Juniperus spp.) woodlands. It is a major tree species in the higher elevations of pinyon-juniper woodlands in Colorado, northern New Mexico, and Arizona, and locally in Nevada and Utah. In pinyon-juniper woodlands, it is found in association with other juniper species such as alligator juniper, one seed juniper, and Utah juniper, as well as Colorado pinyon (Pinus edulis), Mexican pinyon (P. cembroides), and singleleaf pinyon (P. monophylla). Rocky Mountain juniper communities in the northern Great Plains are often restricted to steep, north-facing slopes. Individuals may be scattered across other areas in mountains and canyons throughout the Rocky Mountain region, such as rocky outcrops, butte tops, draws, and floodplains [19,49,58,109]. Rocky Mountain juniper forms open woodland with sagebrush and grasses, and it is often found mixed with Douglas-fir (Pseudotsuga menziesii), Gambel oak (Quercus gambelii), or ponderosa pine (Pinus ponderosa). It is also found along waterways in pure stands or as understory in the cottonwood (Populus spp. )-willow (Salix spp.) habitat type. It forms pure stands at middle and low elevations in the northern part of its range.